Geoff and I went to see "Wal-mart: The High Cost of Low Price" tonight. It's left me sullen and ponderous about economic downfall and corpocracy, but it doesn't benefit me much to write about things I know little about and for which shallow research will only succeed in further incensing me, so I'll write about something positive - bicycle accomplishments. Fat Cyclist solicited cycling-related triumphs from his loyal readers today. I read through the list of impressive accomplishments but already had mine in mind. 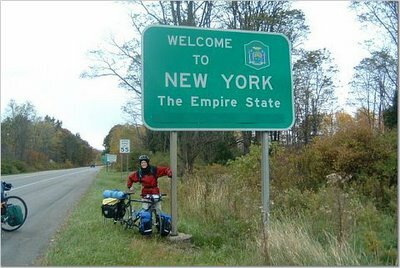 I mean, there was this one time, at band camp, that I rode my bike from Salt Lake City to Syracuse, New York. It's not the Race Across America or the Tour de France, but there are people out there that might be impressed by that. And, in my career, it's a given. I went to the gym between work and the movie. Just as I was leaving, a woman on the recumbent bike complimented me for the hour I put in on the elliptical. I'm one of those shy people, so being complimented by strangers always catches me off guard. Especially when the compliment is directed at something so mundane. I smiled and said "thanks" but I felt as if she had just congratulated me for finishing all of my milk. Following our short exchange, there was an awkward silence and I sort of just slunk away. But, later, I began to wonder which one of us was actually being condescending. We take our triumphs in degrees. My cycling accomplishments have slowly rended their way up from the first time I rode all the way from Salt Lake City to Draper (20 miles!) to rolling over Lizard Head Pass on my first bicycle tour to crossing the New York state line. Since I took up cycling in 2002, each triumph has had an escalating scope, but I can't say that the last was any more rewarding than the first. Now I'm planning to cross into what many tell me is irreversible territory - racing - in what is, for lack of a better term, an insane race. If I finish the Susitna 100, will it really make me feel any better than that first time I rolled up to my parent's house on the rigid, rusty mountain bike I borrowed from a friend? Or am I just locked in a punishing arc of diminishing returns, like a heroin addict hunting for the next fix? Too tell you the truth, I wouldn't entirely mind going back to a time when I would have felt great for spending an hour on a stationary elliptical machine. Is it too late for me? Am I lost? Not every ride has to be a P.B. I think it was Hegel who noted how each accomplishment leads to a new status quo, and a new starting off point for the next summit; and so on . . . and so on. Endurance sports can be addicting in that way. I race long, I run through the night and oh-so-occasionally I stand on the podium… but every time I straddle the saddle, I try to remember how fantastic it was as a kid to ride a wheelie, ride no-handed or simply ride around the block. Thanks for sharing. You’ve accomplished much. Enjoy the ride! There's always another small record being set when you ride or race; you don't have to look for the big accomplishment to get the big payoff. Sometimes, staying in the race when it's miserable is enough to make you feel great, even if you don't win. Reaching your destination is often enough to make you feel good, even if it wasn't your best time. I finished a charity ride quite a ways ahead of everyone else that year -- something that I had intended to do -- and yet my sense of accomplishment didn't come from trouncing my 'competition', it was from having a great two days of riding on a new bike. Don't worry about the euphoria -- as long as you're riding, it'll find you. Just remember it's the journey, not the end. For me every race is just another chance to focus on something in the future. SOme of 'em stretch the personal envelope a bit, soem don't, but they're all good. They seem to give direction, purpose and meaning to training. Once the event is done if I don't have another to look forward to I feel a bit lost. To you doing an hour on the elliptical, is something you do. To that lady, it might have been something she can only hope to be able to do someday. I get family, friends and co-workers who say, "wow you make what you do look so easy. And you do it so fast." To me it's just what I do and yeah I've gotten better and faster than I was years past. But I have stop and remind myself, yeah it's easy to me, but to another they wish and/or appreciate what I've done to get where I'm at. When you were 13 did you ever think you'd have ridden your bike across the country? or consider it within your grasp to do a 100 mile bike ride through Alaska?